In the case of the Comedy idents, each machine is activated by an object. 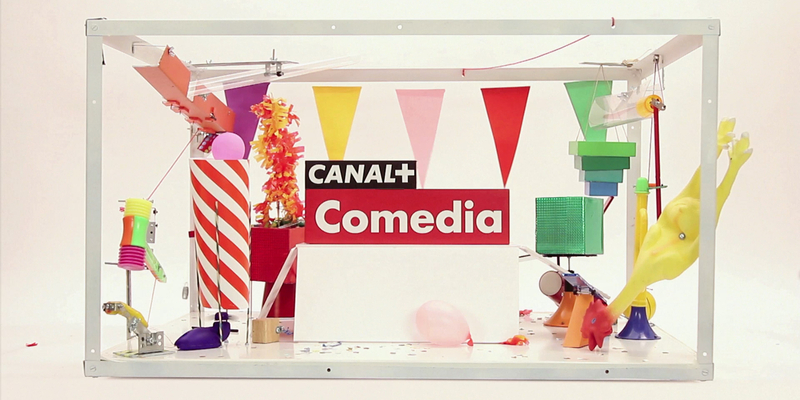 The Canal+ Cine logo is subject to a practical joke, a tribute to slapstick. Heavy Weight: A blue skull sets the tone for a set filled with heavy elements that fall, creating gravity effects, with the logo falling into place at the end. Surprise: Confetti, balloons and other party elements pop out of different boxes, with the logo appearing just like a jack-in-a-box. Scorched: An innocent robot knocks down a wall of bricks, setting off different elements that end with a slapstick of dynamite and a cartoon-like explosion. Cake in the Face: An errant fly sets the ident in motion, using various baking elements that produce a cake. A rolling pin spins, uncovering the final logo.